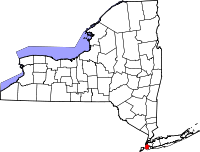 Kings County, also known as the borough of Brooklyn in New York City, is the most highly populated county in all of New York State. The county boasts a population of over 2.5 million residents, and it was founded in 1683 as one of the original 12 counties in the state. The County Clerk for the borough is housed in the Supreme Court Building at 360 Adams Street in Room 189, and the office has various records for the area, including naturalization records dating from 1907 to 1924, among others. The City Register maintains property and deeds records for the area, and allows the viewing of records dating from 1966 to the present online via an online database. The New York City Clerk maintains marriage records dated from Jan 1st, 1930 to the present for the entire city.